-The massive flooding wiped out roads and bridges and claimed the lives of over 1,200 men, women and children. What was left was thousands of people with their entire lives swept away by the raging waters left to rebuild what was remaining of their past lives. On December 16th, 2011, as the world was preparing for the holidays, tropical storm Washi (Sendong) made landfall over the Philippines. The storm brought over 10 hours of heavy rains causing already high local rivers to rise 11 feet in under an hour. In one horrible night, hundreds of families disappeared as flood waters and landslides wiped away homes along the river and mountain sides. Survivors tell a story of horror as they clung to anything they could grab onto as 55 mph winds whipped over them carrying the screams of families as they got swept away by the angry waters. The mayor of Iligan, one of the hardest hit cities, regarded the floods as the worst in the city's history. Estimates had the damage at 50 million dollars but there was no figure to weigh the impact that the storm had on everyone's life. 100,000 people were displaced from their homes and forced to find refuge and begin to rebuild their lives. 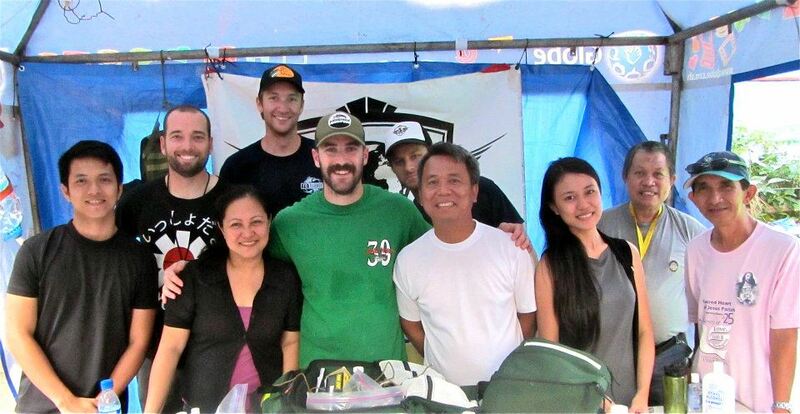 Reach Out WorldWide, a California-based team of volunteer EMT's, paramedics, firefighters, construction workers, doctors and nurses assembled a crew and headed out to one the most devastated cities, Cagayan de Oro. ROWW was one of the first organizations on site after the storm had cleared. "We had no idea what to expect. Reports coming in had been pretty vague and we just wanted to make sure we could get out to the people in need as quick as we could and get to work. As soon as we landed we never stopped moving. Whatever we could do to help we did." Recalled one team member. The amount of people affected was enormous. Most of the houses in the area had been constructed of aluminum siding, galvanized steel and barbed wire and when the flood waters disintegrated them they became deadly projectiles slicing and impaling anything in its path, as it rode the wall of water through the cities. The speeding loose metal and debris ripped people and anything else in its path apart. Minimizing the spread of infection quickly became a top priority. Standing water, no source of clean water, dead bodies, trash and debris all had lead to a very serious problem. It seemed everyone had open wounds and they were all becoming more infected by the minute. Thousands of the survivors had gathered in evacuation centers around the cities living in tight quarters increasing the chance for the spread of infection. 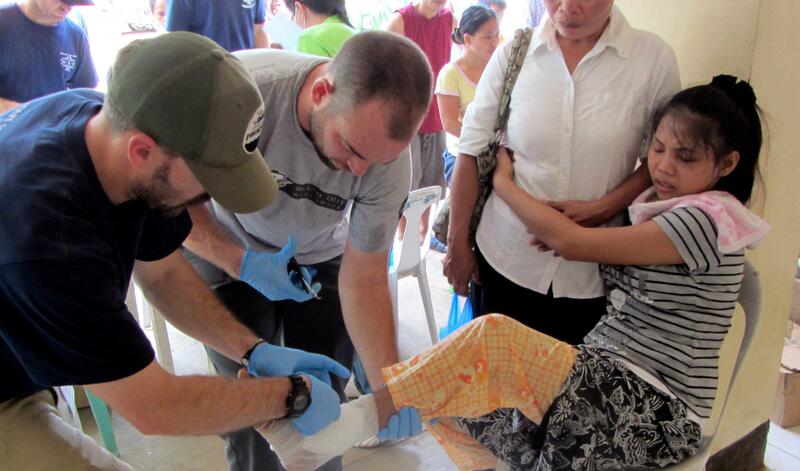 It was Reach Out WorldWide's job to get to these victims, secure medical and first aid equipment and get to the people in need. 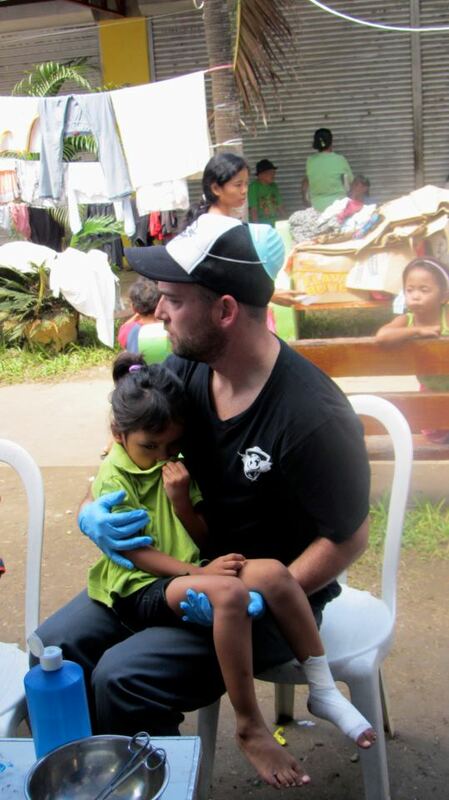 Along with providing medical care to hundreds of injured people, the team found other ways to help. While searching for victims the team came across a group of about 40 families that had set up refuge in an area that had been completely washed away by the floods. They had lost everything and had banded together in hopes that their numbers would help them survive. 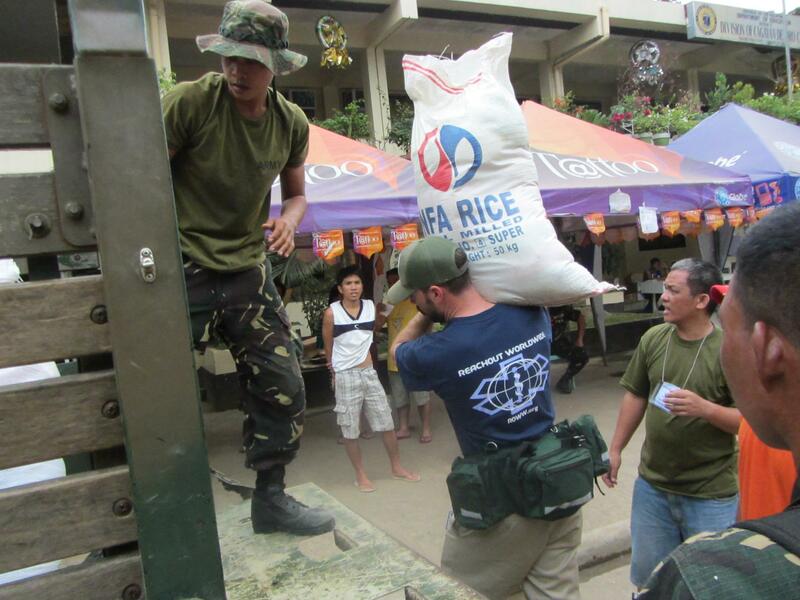 The team immediately headed back to a town where they could gather supplies and returned later that day with enough food to feed each family for 3-4 days. storm. The team was informed that this man provided for a family of over 30 people with his fishing business and he was left with nothing. After meeting with a local city leader the team purchased a new boat and new fishing nets for the man. He immediately broke down crying. 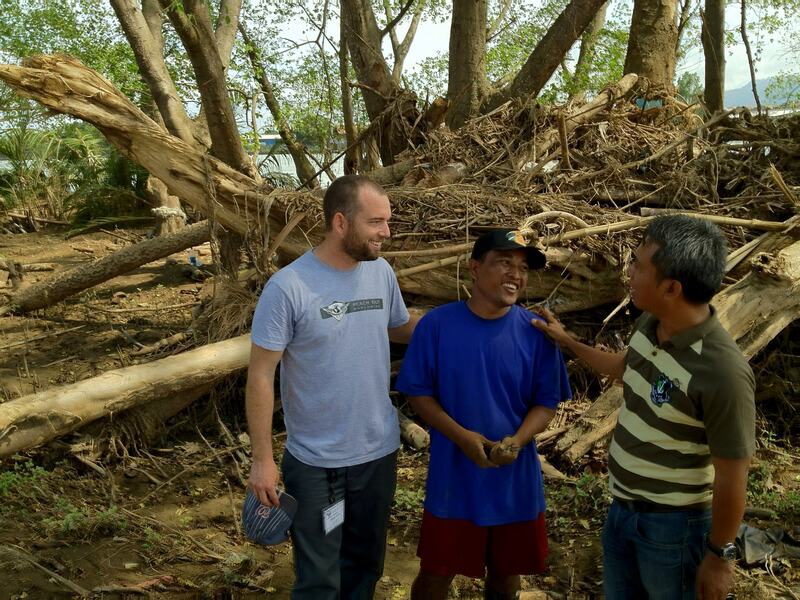 "It was one of those moments that made you realize that we can make a difference in helping these people return to some sense of normalcy" said another team member. 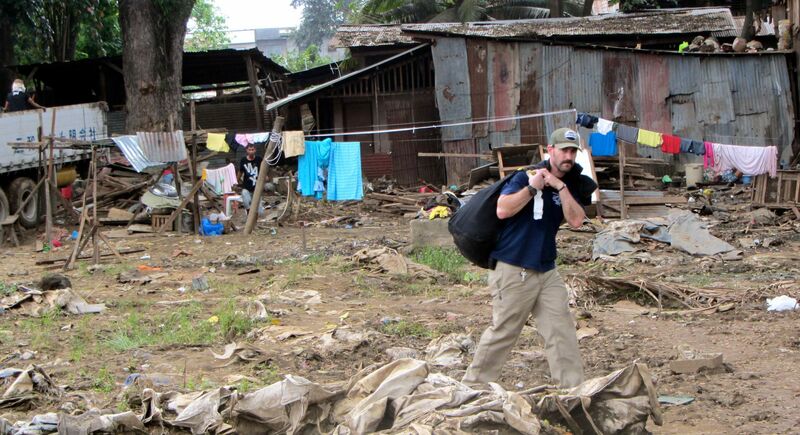 None of this could have happened without the help of the great people of the Philippines. Even in this horrific time of need, communities stayed strong and banded together. It was a true showing that the human race is the strongest race. It was inspiring to see the selflessness that Reach Out WorldWide believes in so strongly, being demonstrated by the very people that needed the help the most. We only wish we could have done more. Salamat! Special thanks to Pelican for providing us the best gear to get our medical equipment transported safely to the Philippines. To Direct Relief International - For their donation of medical supplies for the mission. To Rick Gambo for donating the communication supplies. Thank you to Mayor Carmen Cari and Vice - Mayor Michael Car of Baybay City, Leyte for helping us with transport, giving us a place to stay for the evening and were amazing facilitating success of the mission.